I’ve just discovered where those voices in my head have been coming from. The culprit is the Songbird Clear sound enhancement device I’ve been testing the past few days. It’s not a hearing aid per se. 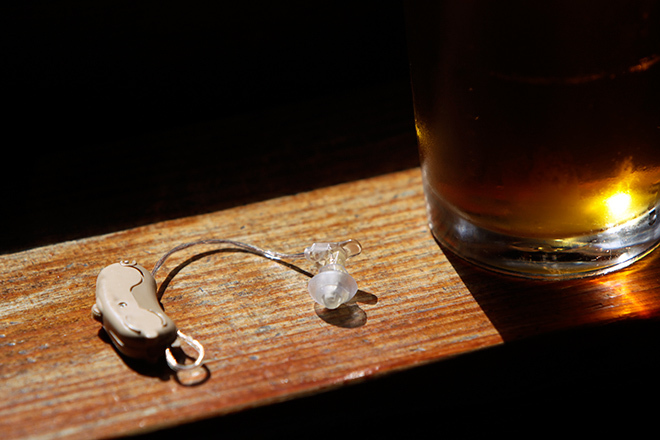 It’s a tiny sound amplifier that fits into your ear and looks like a hearing aid. Hearing aids, which can cost thousands of dollars and require several trips to the doctor, can replace sounds the ear has lost, like high and low frequencies. The Songbird Clear, on the other hand, is sold over the counter at drugstores for about $120 and boosts sounds your ears are already capable of hearing. It just makes them louder. The sound it produces, however, is akin to being in a stadium with the announcer’s voice lodged permanently inside your head. Imagine this — whenever you’re talking to somebody, they sound as though they’re calling out the starting lineup over the public address system at the ballgame. You get the same effect whether watching television, using the phone, or enjoying an afternoon brew with the boys. The Songbird Clear, made by Songbird Hearing of North Brunswick, New Jersey, also picks up background noise. As I paced my house, the creaking of the hardwood floors beneath my footsteps sounded like a Gatling gun. Next, I thought the traffic speeding outside my house was about to crash through the front door. While writing this review, the clicks from my Magic Mouse sounded like a Zippo cigarette lighter opening and shutting, and the noise coming from my keyboard was less like gentle typing and more like a Sammy Davis, Jr. tap dance. But that’s just a trade-off for a personal sound amplification system that’s sold over the counter in retail pharmacies for a reasonable price. I’m right in the target demographic for this device. I have what’s known as surfer’s ear, which crept up on me over three decades of paddling in frigid waters. I haven’t had my hearing tested recently, but I often ask people to repeat what they’ve just said. Sometimes I falsely assume what was just said and I get myself into unspeakable trouble. In my testing, it worked as expected. It operated better when used at the minimum volume level, which seemed about right for somebody with my hearing condition. When I first stuck it in, the Songbird Clear made some feedback and whistling noises. So I added the included foam ring around the ear-insertion piece. That tightened its fit into my ear and mostly stopped the reverb and feedback. But nothing got rid of the light fizzling sound that I heard constantly. It comes with a micro-sized “312? 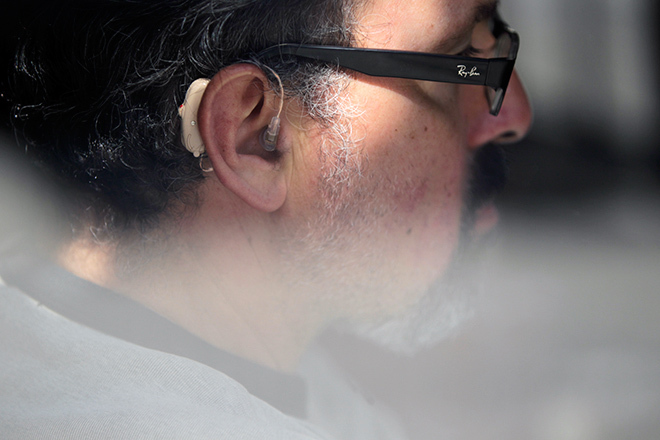 zinc hearing aid battery, and you can insert it by pulling open the 1-inch-plus amplifier. I fumbled the battery a few times. The package came with two batteries, and one of them was DOA. Luckily, these are cheap (less than a dollar each) and available at drugstores. You turn it on with a tiny power wheel on the back of the unit, then you set it to an appropriate level somewhere between 1 and 3 on the dial. The wheel’s volume numbers are so small you might need a magnifying glass to see them. It’s more of a “by feel” thing. After placing the device behind your ear, you insert the attached ear bud into the ear. It’s fairly simple and you can do it with one hand. You have to make sure the bud is tightly in your ear, or else the feedback starts right away. Once you have a tight fit, you barely think about it — unless, like me, you wear glasses. The frames on my eyeglasses loosen the device when it’s lodged behind my ear, which is a downside. Oh yes — the included ear-wax removal device is essential. WIRED Available at drug stores without a prescription. Ridiculously cheaper than a doctor-ordered hearing aid (the company also has some more expensive models that range up to $300). Might help you overhear the next big idea at Starbucks, or decipher your spouse’s sarcastic, under-the-breath mumblings. TIRED Sound quality is about as subtle as a bullhorn. Makes you look like a Secret Service Agent or an old man. Fit is compromised if you wear glasses. Doesn’t go to 11.